This is the proper, old-school way of cleaning and checking your chain. Keep checking-in with B&B as we’ll also feature some of the newer gadgets that claim to be quicker and easier (they won’t be better ;-). Probably the easiest yet most effective maintenance you can do is to look after your drive chain. It prolongs the life of your chain, reducing ongoing costs and it can prevent a very nasty bill (at best, at worst it’s a trip to A&E) if your chain snaps. And it can also reduce excessive wear on your sprockets. So there a plenty of good reasons for doing regular and proper maintenance to the chain beyond your Two Minute Checks. All you need now is a simple step-by-step guide. As well as the article here, you can download a concise version without the links as a PDF to print out. The types and sizes of spanners and the need for allen/hex keys depends on your bike. You will make your life much easier if you raise the rear wheel. Everything below can be done by leaving the bike on the side stand and moving the bike forward every time you’ve completed a section of chain, but doing it that way is a complete pain in the backside. 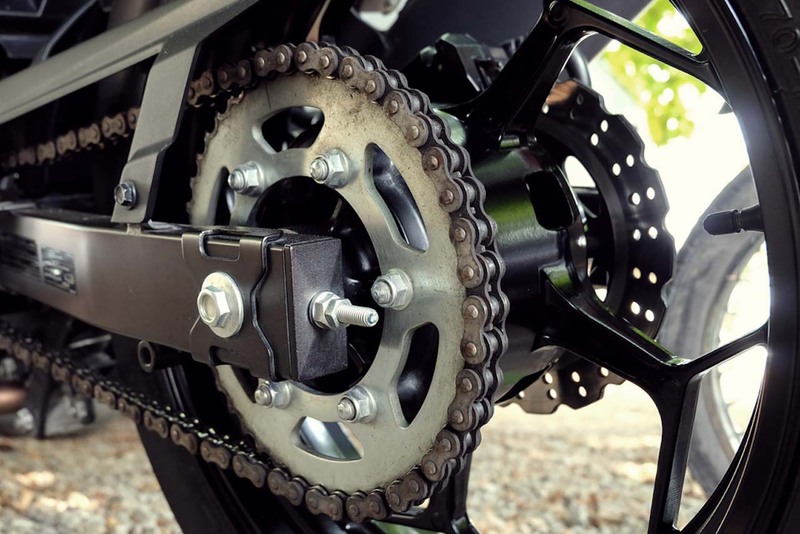 If you don’t have a centre stand – common with sports bikes, for example – then look at investing in another method for raising the rear wheel so that by turning the wheel you can easily rotate the chain. Depending on the type of stand, you may need to fit mushrooms to slot into. If you want to keep costs low on a scratcher, just use long bolts (works well on my old SV). The Abba Superbike centre stand (it actually fits over 300 models, not just superbikes) is probably the easiest piece of kit to use, but it takes longer than using a paddock stand. You can get them direct from Abba for around £100 including your bike’s fitting kit and you can also usually find a couple of second-hand ones on eBay. The Rollastand sits under the rear tyre and is in effect rollers that stay in place so that you can spin the wheel. They are a great solution if you don’t have much storage space, but a paddock or Abba stand is more useful as you can take the whole wheel off – when you need to replace the chain, for example. Get a friend to pull the rear wheel up using the side stand technique. Take your time to do your work – just to see what their boredom threshold is. There’s little point in cleaning a chain that you subsequently discover has become dangerous, so do your chain condition check first (although you will have been doing your TMC regularly, won’t you, so you’ll be familiar with its condition…). There’s also little point in checking for slack if the chain as actually had it and the quickest way to check that is, at the furthest part of the rear wheel sprocket, pull the chain back. A little bit of play is OK, but if you can get a screwdriver in between the chain and sprocket, it’s time for a new chain. If the chain passes that test move on to the tension. Midway between the rear wheel sprocket and the front (gearbox) sprocket, move the chain up and down. You are looking for around 3.5cm (11/2”) of movement. Rotate the rear wheel (move the bike forward) so you can check another section and keep repeating until you reach the tightest spot of the chain. If you have found more movement in the freer-moving parts of the chain don’t worry, it’s the tight part that you need to make sure has no more than 3.5cm movement. If the signs are the chain is too slack, you’ll need to move the rear wheel back to reduce the amount of slack. Bikes have different ways of adjusting the rear wheel, but they all share a common sequence: Loosen, adjust both sides, check the tight spot is now a maximum 3.5cm, tighten. If you have tightened the chain too far kick the wheel forward and go again until you get the correct amount of tension. If you can, get a friend of equal weight to you to sit on the bike, as your added weight tightens the chain. If you always carry a pillion, pop them on the bike too, as thier weight also contributes. When adjusting you’ll find markers along both sides of the swing arm. You must make sure both are adjusted by equal amounts or your rear wheel will be misaligned. If you find excessive wear on the chain or have had the chain for some time (6-12 months for aggressively ridden sports bikes, longer for more casual riding), check your sprockets for wear. In a nutshell, the ‘spikes’ on the sprockets shouldn’t be spikes at all but flattened on the end. And you want a clear, round ‘U’ rather than an oval shape where the chain sits into the socket. You should clean your motorcycle chain every couple of months or so, more often in the winter. The reason is that, while the chain looks like a solid bit of kit, especially compared to your pushbike’s weedy effort, inside it contains rubber parts – ‘O’ rings or ‘X’ rings depending on the type of chain that keep the inner and outer parts of the chain apart – and these parts are susceptible to premature wear if not looked after. Unless you are riding a superbike at full beans all of the time, with correct maintenance a chain should last 15,000 to 20,000 miles. A poorly maintained chain could be toast after just 5,000 miles and at a £100+ a pop, that’s an expense you can do without. Simply wiping down a chain with a rag to keep the water off after a wet ride is not enough. Road film – grit, dust, salt – is flung up into the chain by your front wheel and the air disturbance your bike creates. This finds it’s way into the links themselves and can damage the rings and stick to the lubricant that helps the rings and links do their job. Mixed with the lubricant itself it forms a grinding paste that literally rubs the delicate parts of the chain away. The catch 22 with lubricating chains is that the very oil you use to protect the bike also helps dirt stick to it. That’s especially true of chain lubes that effectively glue the oil to the chain to reduce fling (the oil that is thrown off the chain by the momentum of the bike, often onto your rear wheel). That’s why some people, myself included, prefer to brush on ordinary engine oil instead of the gluey sprays – you get better protection for your rings, but it’s a bit messier and you need to do it more often. Use WD-40 or a degreaser to do the same. However, the jury is out on using either of these as some people believe the rings can be damaged by chemicals in the products and with degreasers especially you need to check that the product is safe to use with rubber. One technique to reduce any potential impact of using displacers and degreasers is to not spray directly onto the chain but onto a cloth and then wipe the chain down. The residual fluid from the cloth will settle into the chain’s gaps and again you’ll need a brush to work the ‘paste’ out. Or, if you are just happy to spray away, place a piece of cardboard between the chain and the rear wheel to stop getting spray all over your tyre and rim and use a toothbrush to work the dirt out. Wipe off any excess. Hold the nozzle near enough to the top of the chain so that you don’t get overspray onto the wheel and swing arm, but not so close that you overload the chain itself with lubricant. If the chain has a guard that you can’t be bothered to take off, do this at the back of the chain where it sits around the socket. Rotate the rear wheel at an even speed until the whole chain has been coated. Then switch position so that you can spray the inner part of the chain. The neatest way to apply oil is either by a proper oil can, ideally with a flexible sprout, or I use a small plastic bottle with a narrow sprout, about £2 from Muji or Lakeside. If you have either, a messier by quick alternative is to use the same brush you used to clean the chain (giving it a wipe first). Again, rotate the wheel, probably more slowly than if you were using a lube can. Wipe off any excess. This method is slower but again way cheaper than using a dedicated product. And it’s arguably more healthy for your rings. Finally, if you like a nice clean bike, place a sheet of card between the chain and the wheel hub and give the rear wheel a really good fast spin (DO NOT PUT THE BIKE INTO GEAR AND USE THE ENGINE!). This should see any excess oil that is due to fling off get stopped by the card, instead of spoiling your nice clean rim. If you don’t have a centre stand get a rear paddock or Abbas stand. It will halve the time it takes to maintain your chain regularly. Engine flushes: Can you really get extra bhp out of a small bottle?